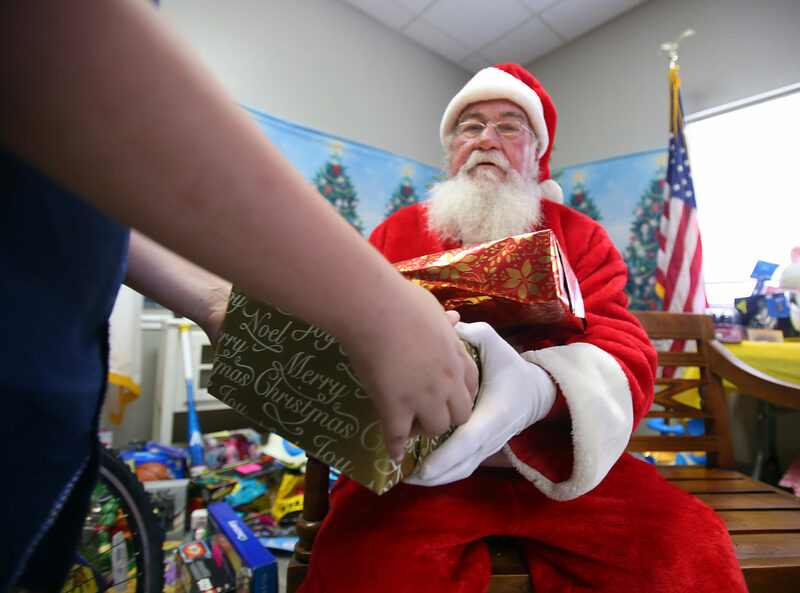 Santa Claus hands out toys to children during the Buckner Toy Run at the Rio Grande Children's Home on Saturday, Dec. 1, 2018, in Mission. Santa Claus hands out toys to children during the Buckner Toy Run at the Rio Grande Children’s Home on Saturday, Dec. 1, 2018, in Mission. The halls were decked with boughs of holly as dozens of children felt the comfort and joy of Christmas, Saturday. 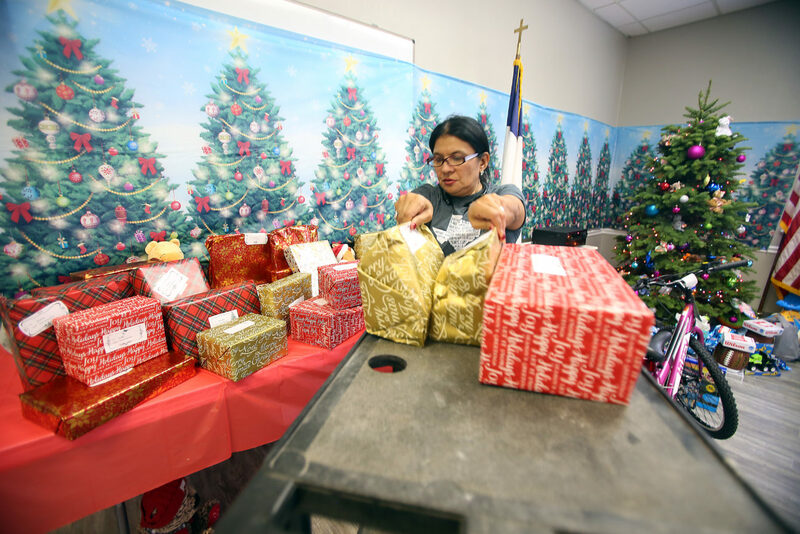 It was all part of the eighth annual Christmas toy giveaway at the Buckner Rio Grande Children’s Home in Mission. The South Texas Law Dogs Motorcycle Club donated the toys as part of the club’s annual fundraising campaign. About 100 children call Buckner home and have been placed there because court officials found abuse and neglect at the hands of their birth parents. Now many of them wait at Buckner to be adopted or placed in foster care. But Saturday, only one thought occupied their minds — Santa! The girls and boys munched on holiday treats and took part in festive games, unaware of the gifts they would soon receive. “I hope I see Santa,” exclaimed one excited child at the celebration. According to Buckner Children’s Home spokesperson Christopher Ruth, the toy giveaway often lifts the spirit of children during a fragile time of their lives. Veronica Rinehart sorts toys during the Buckner Toy Run at the Rio Grande Children’s Home on Saturday, Dec. 1, 2018, in Mission. About 80 Law Dogs Motorcycle Club members arrived promptly at noon at the Buckner Children’s Home campus. Each biker wore a red button down dress shirt, along with black vest bearing their “colors.” They carried gifts for the children who lived at the home. The bikers rode their motorcycles in a thundering herd from the KGBT-TV studios in Harlingen to Mission. In addition to Channel 4, toys were collected at various locations throughout the Valley. Bikers also paid to take part in the toy drive. Each rider donated $25 to the cause, passengers donated $15. Organizers say they expect to raise about $3,000 this holiday season. Allen Flores is the president of the South Texas chapter of the Law Dogs. Flores says members of the club look forward to the event each year. And the man the kids all came to see was seated with fellow motorcycle riders at the children’s home dining hall. Mike Green, or Santa Claus as he’s known to the kids, has dressed up as the fellow from the North Pole for about eight years at the children’s home Christmas celebration. He also has the honor of handing out presents to the children, one-by-one and calls each child by name. Maria Fernanda is an 8-year-old child living at the foster home. Maria Fernanda says Christmas is her favorite time of year. However, this year, Christmas has taken on a special meaning for her, as a foster child.